The development of trade fairs in the Asia-Pacific region has been highly uneven, with large differences between industries, cities and countries. Based on a knowledge perspective, this book is the first of its kind to connect economic growth with the rise and development of trade fairs. 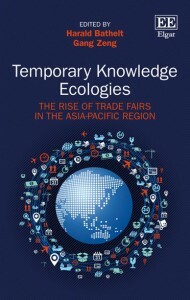 Using country-specific case studies, the contributors identify three key areas of exploration: knowledge generation and transfer processes through trade fairs, interrelationships between industrial and trade fair specializations, and linkages between economic development, industrial policy and trade fair dynamics. They demonstrate that trade fairs in the Asia-Pacific region have evolved from transaction-oriented places to knowledge-based and relational spaces. Researchers and students of economic geography, political economy and related disciplines interested in exploring the role of the developmental state in the Asia-Pacific region will find this book to be highly relevant. Policy makers and regional planners seeking to understand the role of international trade fairs will also find this to be an insightful study.